Nea Chora is a very long sandy beach, located 1km west of Chania city center, along the Akti Papanikoli Street. You can walk to here from Chania harbor, it takes around 15 minutes. 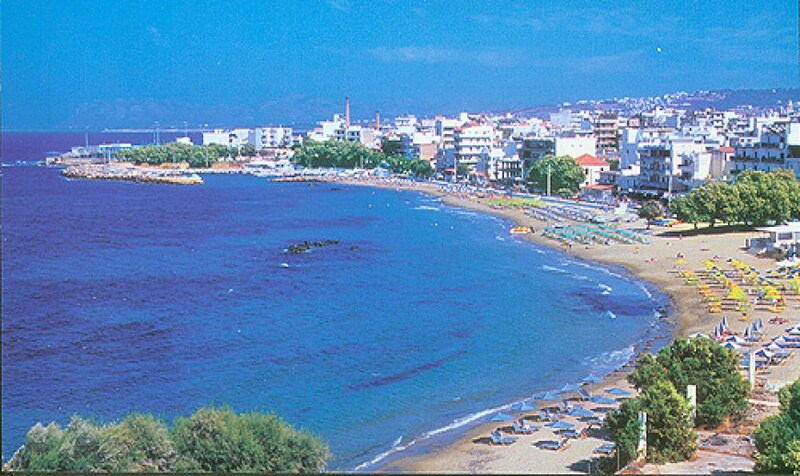 The main beach of Nea Chora is very well organized, with several amenities nearby. It is a nice sandy beach, with rocks in some places. Nea Chora is ideal for those that do not want to leave the city centre. Beyond the east side of the beach, there is the old soap factory (you can still see it's high chimney) and the satatorium of Chania. Nea Chora is popular to locals for it's fish taverns. Of course, there are many taverns, restaurants, snack bars and cafes in the area. A second beach is shaped beyond the river Kladisos and extending up to Aptera beach. Kladisos beach is a nice long sandy (and pebbly in places) bay. Despite the fact that this is very close to Chania and it is very nice, this beach is secluded and not organised. The easiest way to access the beach, is by crossing the Kladisos river, using the pedestrian bridge. The "Sardine Festival" is organized every summer at the beach of Nea Chora, with traditional music, dances and free fish for the visitors.